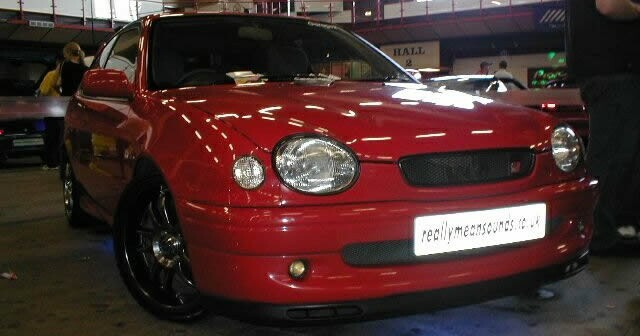 The Kings Hall in Belfast was the latest venue for the 100% Modified show, previously held in Dublin…. 7.30am, and I was at the Kings Hall, starting to set things up for the RMS stand. The Lamborghini which had been left in the night before looked absolutely stunning, and when Robert (madmodding) and Chris (chrisnomates) arrived with the corsa and MR2, things were looking really well at the RMS stand. 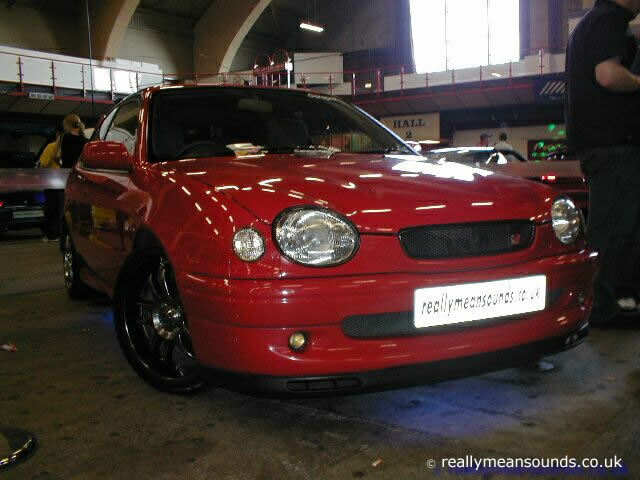 Outside, the other Robert (RMS Corsa Sport), was preparing his corsa for the SPL competition at the IASCA sound off. The jon44w clan was also down minting their pride and joy, and about 8 the cruiseirl team appeared, bringing among other things a tasty blue dimma-kitted 106 and a Mazda RX7. The doors opened at 10, and as people flooded in, we made a quick dash to the chippy before the queues started! Outside, the misty skies cleared to reveal a scorching hot day and this made the sound off area and private entry arena much more enjoyable. I spent most of the day, however, manning the RMS stand. I was regularly swamped by forum members – and the window stickers were in high demand! Both Revs and Max Power jounalists were over to have a chat (and to get a few pics of the Diablo!) Performance Car Club (until now which I have never heard of) who were facing the RMS stand caught my eye though, and I randomly left RMS to get some fantastic pictures of girls sprawled across engine bays and the like! Towards the end of the day, I noticed something strange about the rear window of the Corolla – there was a cruiseirl sticker on it! Anyway, it was all in good fun, and as I worked my way around the other stands, everybody seemed to be pleased with the show, and up for a bit of banter. As with Dublin, there were styling awards, and the winner of the extreme styling award was none other than Chris Cole from the RMS stand, with his silver MR2! Great fun was had by all – as you can see from the pictures there were many fantastic women (including Jakki Degg), and Ala G – who made a great Ali G impersonation. All was not over though – Antrim lough was the word on the street, and a cruise was imminent.